Newcastle v Birmingham match preview: top 10 finish in Pardew's sights | NUFC Blog. Birmingham City are the visitors at St James’ Park on Saturday, where Newcastle United will be keen to go after all 3 points and try for a top 10 finish. Birmingham are 3 places, 2 points and 15 goals worth of difference behind us in the league with them occupying 15th place against our 12th place. They’re also just 3 places and 4 points above the relegation zone, although personally I think they’ll survive. If we can take all 3 points and Stoke and West Brom have poor results we can sneak into 10th which, judging by his recent comments, is now Alan Pardew’s aim for the remaining 3 games. “Steve had a fantastic younger part of his career and then he’s hit a bit of levelling-off when he’s not gone forward or backwards. That can be dangerous for a player. He needs to get his career moving in the right direction again. “He’s a young centre-half with tremendous qualities and he must have the mentality to use those. “He was a bit unfortunate when he first came back into the team because he ended up playing in a couple of positions that weren’t his favoured one. I wanted to see what he could offer at right-back but now he’s back playing in his natural position. “We’ve changed his training programme and his diet because he was getting too muscular on top. We’ve tried to slim him down a little bit and he looks better for that. He looks quicker. Ah, so it was Taylor’s job to eat all the pies after Mark Viduka left. I did wonder. Still, it seems we should now be seeing a slimmed down mean machine on Saturday. It looks as if we’ll most like have a starting XI along the lines of: Tim Krul (or Steve Harper), Danny Simpson, Steven Taylor, Fabricio Coloccini, Jose Enrique, Joey Barton, Cheik Tiote, Kevin Nolan, Jonas Gutierrez, Shola Ameobi and Peter Lovenkrands. Birmingham will probably line up something like: Ben Foster, Stephen Carr, Roger Johnson, Martin Jiranek, Liam Ridgewell, Sebastian Larsson, Barry Ferguson, David Bentley/Keith Fahey, Lee Bowyer, Kevin Phillips and Cameron Jerome. Craig Gardner (suspended) and Nikola Zigic (who is currently injured) are Birmingham’s top scorers with 9 and 8 goals respectively. After beating Birmingham 2-0 at St Andrew’s we’ll be looking to do the double over them and, whilst I think we’re perfectly safe now anyway, another 3 points should dispel the fears of even the most ardent of relegation doomsayers. Kick of is at 3PM on Saturday and Chris Foy officiates. Is Craig Gardner not suspended for the game? You’re right, he is. I’ve updated the post. Also just looking at the fixtures and the 3 teams above us dont play until Sunday/ Monday.. So if we can get a win we will go 10th, then hopefully Stoke and WBA drop points. 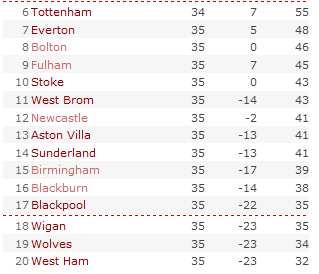 If Fulham dont beat Liverpool we will be 1pt behind them aswell. However this all does depend on us beating Birmingham! I think it will be a tight home win, unless our Midfield can chip in with a few :). The squad diminishes yet further. brum are gonna be right up for a scrap for their PL lives, so it’l be a tough game. We really need a boost though, to settle a few of the natives nerves & fevered brows. It’s extremely difficult to predict Toon results this season because we’ve been erratic and much depends on which team turns up on the day. I’d like to think we’ll pull our socks up for this one though, so I’ll go for an uninspiring 1-0 to us. Who would be your choice for goal scorer? Tez, if I had to pick I’d say Nolan. On the button, those fa gadgies. well chelsea is oot the window,they will take us to the cleaners.i think we could narrowly beat brum,but saying that we look like we could play all day,and not score. west brom are on a bit of a roll,so that will be a tough game,i can see us getting a point.finally tally for me,45 points. Any points NUFC get will be the result of scoreless draws. That could happen in all three games. Thought West Brom seem the team most likely to score against NUFC. After the none performance of Sholla and Lovenkrands against Liverpool i would drop them to the bench and start with Shefki and Ranger then hope that Nile finally steps up to the plate . Its worth the gamble imo , lets face it Brum are hardly a top 6 side not that we are either . i would say 2 equally matched teams . I would think that Chelsea might just put one or two past us too BeeGuy!